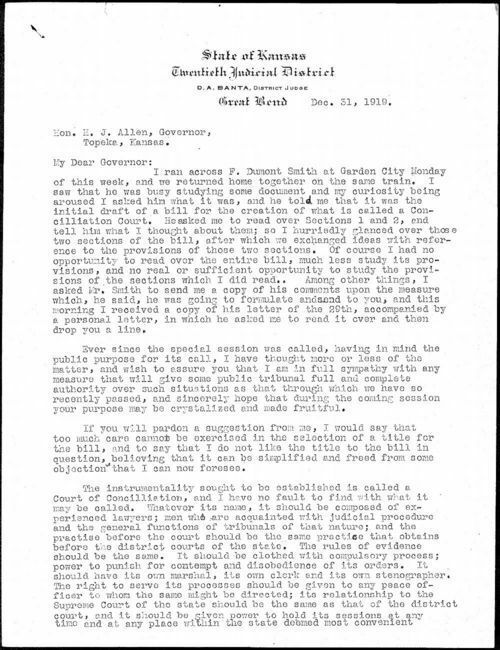 D. A. Banta, a district judge from Great Bend, writes Kansas Governor Henry Allen, of Topeka, about the proposed industrial court legislation. In the letter, Judge Santa tells the governor he has had opportunity to read the initial draft of the legislation and offers suggestions on how the document may be improved. The Court of Industrial Relations was created by special session of the Kansas legislature in 1920. During its viability, the court presided over several employee/employer disputes. In 1923 the law was declared unconstitutional by the United States Supreme Court. The court was abolished in 1925. Call Number: Governors Office Governor Henry Allen Box 11 Industrial Relations Court "B"